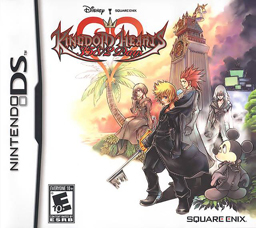 Pronounced as "Kingdom Hearts" in Japanese, was my favorite game for the Nintendo DS and PS2 if I could have one myself. The game I'm playing is Kingdom Hearts 358/2 Days, specially made for DS because of its multiplayer system ? Whatever it is, as long as I could play it then it'll be fine ! I know its been released for almost half a year for the Japanese version and around 2 months for the English version, the fact is: I liked the game play really much ! To be honest, the graphic of this game is surperb. Looking for a better 3D cutscene game ? You just had to buy yourself a PSP then if you're thinking of a handheld gaming console. Musics ? I like "This is Halloween", "The 13th Struggle", "Tension Rising", "The Other Promise" or "Roxas' Theme" and "Xion's Theme" as well. Recently I found that I'm in love with "Namine's Theme" too... Variety of musics in this game sure makes me feel like listening to a soundtrack while playing it. Background musics sure makes me insane ! Well, I've beaten the game once ... to be exact, TWICE: one in Japanese, another in English. Since I understand English better so my English version's progress is further. Proof ? Oh, see what weapon am I using ? "This looks awfully familiar..." of course it looks familiar, its an umbrella ! (Under my umbrella ?) Its a joke weapon that I earned by getting some crown tokens. 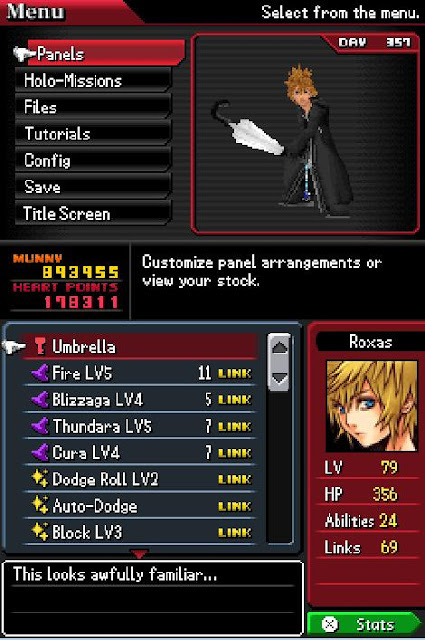 You gotta check out what the remaining 12 Organization XIII's member using by yourself... its damn funny. The story really catches me. Whatever the game I'm playing at, the graphic catches me first, then the musics and lastly the plot. Organization XIII, an organization consists of 13 Nobodies (beings without heart but had a body) where purpose is to get Kingdom Hearts, where the hearts of all hearts are in order to become a whole being again. A 14th member joins in soon after the 13th member Roxas, our main character here, joined the Organization. Given the name Xion, a girl who're able to wield the Keyblade, an ultimate weapon that could release the hearts captured by Heartless (beings which their hearts consumed by darkenss). 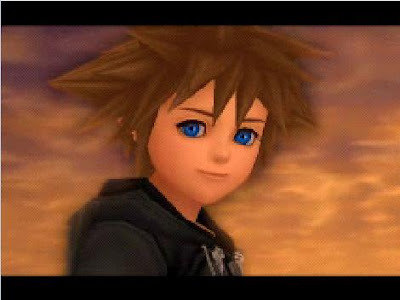 After a while, she experienced some memories where she doesnt know how it got to her: familiar beach, ocean and an island... soon she realized that she's a Replica created by Vexen to replicate the Keyblade Hero's power so the Organization can get Kingdom Hearts in no time. Of course, this information doesnt kept for long. 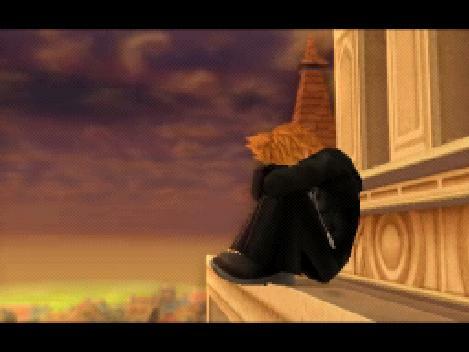 After Roxas knows it, he ran away from the Organization, but turns out he doesnt have anywhere to go and he went to his favorite hang out spot: top of the clock tower in Twilight Town. 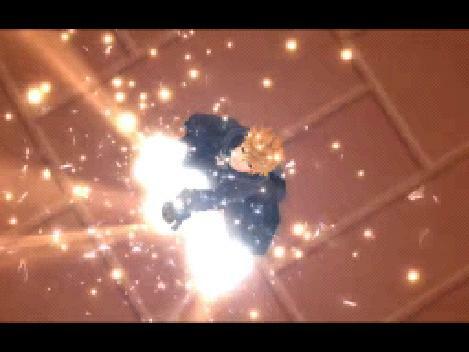 "It is time for me to unite with you Roxas. Cant you see, this is why I was created." ...crystalized ? 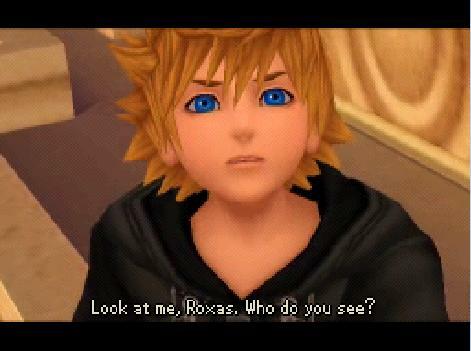 But the thing is, her essence was absorbed by Roxas since Roxas is Sora's Nobody and Xion possessed Sora's memories. 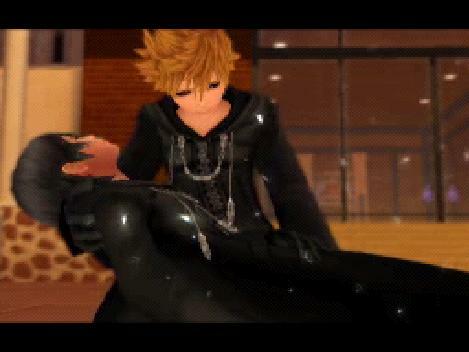 Yeah, very touching scene, especially when "Xion's Theme" was turned on at this cutscene ! The good news is, after absorbed the essence, Roxas is now able to duel wield: using two Keyblade at a time ! Let me explain a little about Nobody: they had no heart, hence no emotion, no feeling, no happiness...they're just empty inside them. 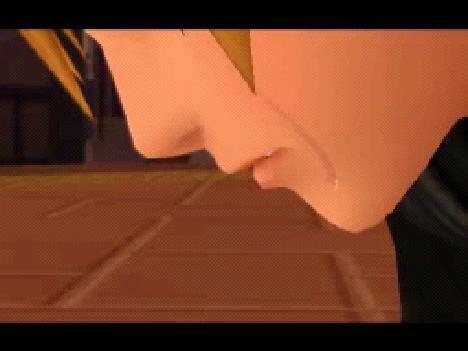 But erm...since Roxas is a Nobody of Sora, did I saw tears on his cheek ? 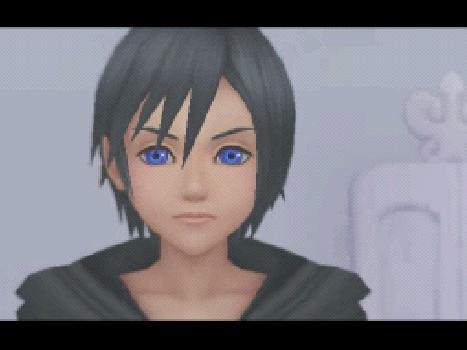 Something must be wrong with him, and the explaination may be found in the coming prequel Kingdom Hearts Birth by Sleep. Ah, enough of the game already. Just by mentioning it, how hard I wish I could have a PS2 so I could play the game and get ot know the story ! "Playing game is like reading a novel. The only differences is you know the story as an outsider by reading; while you know the story as an insider by playing." In the end, rating from me ! 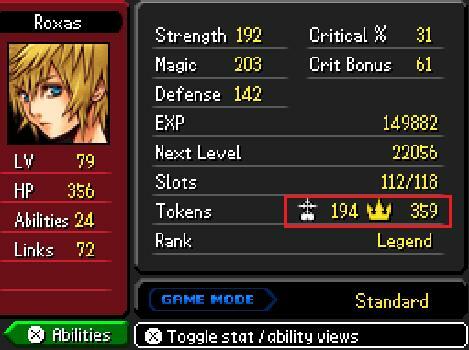 Overall rating for the game that I beaten twice ? 9.8 out of 10. Finals Coming ... Already ? 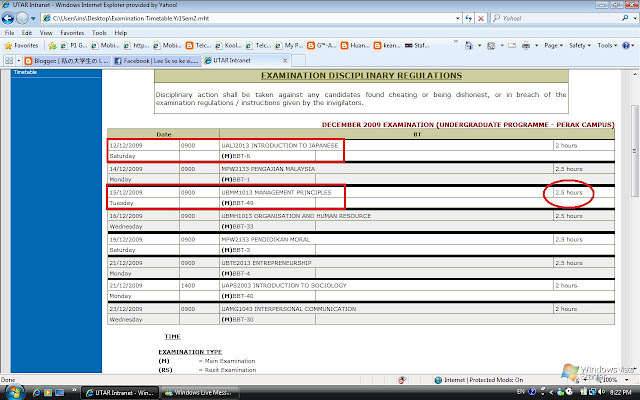 Well, it seems so, the final exam is really coming soon. But come to think of it, next week is week 7, and there's a study week after that, final exam havent reach us just yet with 2 weeks gap...so coming SOON isnt the wrong thing to say then ! Whats more, its a 9am examination, I couldnt think of myself that what time should I get myself in bed the day before the exam. I couldnt miss the chance to be absence for the exam just because I over slept ! 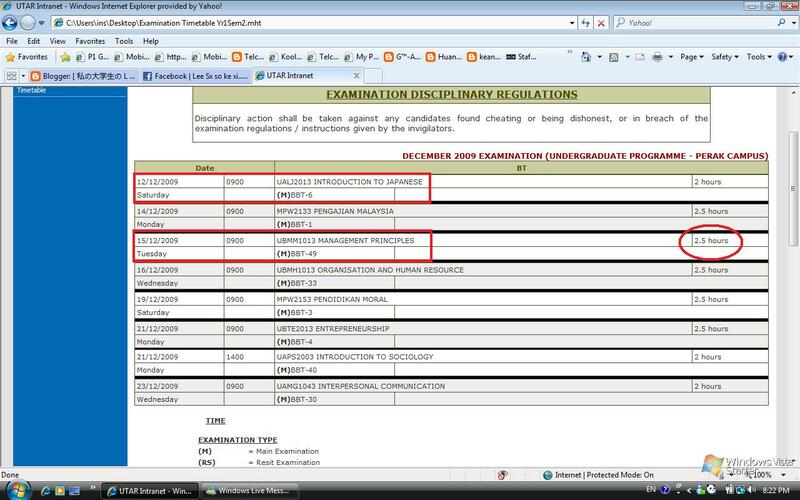 Oh, same goes to Management Principles on Tuesday, 15th December. At the mean time what should I do before the final starts ? Seems like sleeping is a very good choice. I'm home alone again, as usually I do for every Friday till Sunday since all my housemates went back to their hometown on either Thursday or Friday. I'm very glad that the house's modem was fixed and at least I had a companian with me for the boring weekend: Internet. Finally the house's internet connection was fixed and I'm able to online again ! What a great news to me and my fellow housemates too. I'm now proudly posting this as a reminder of the day where the savior fixed the modem for our house. A million of thanks to that friend of David ! どうも　ありがとう　ございます ! So, the modem was fixed and we're (more precisely, I, as I'm the only one in the house...again, like usual) able to use the direct...wait a minute, direct line was not working ! So it seems like we're only able to use the wireless then, which is better than having nothing at all ! At the mean time, I wish that David will be back and fix it so both direct line and wireless could be used. By the way, its really late now and I think I should go for bed. And one more thing: Happy birthday Jestrine. I was thinking to send you a SMS sharp 12am, but it seems like there's been a blockage somewhere as I couldnt send out the message. May your dreams and wishes come true and be happy. Never thought that I'll be writing an "offline blog" even though I'm in a situation where I can go online easily ! And so, misery life began. Being cut off to the virtual world of internet seems to be a little boring for the coming days. No more usual Facebook, One Manga, MSN chatting and blogwalking too ! Thinking of reading Deathly Hallows which I started a few chapters back during the beginning of the semester...but the book remained stationary with a thin layer of dust on it. Well...I know its all about personal stuffs huh, but come to think of it, assignments and presentations are stacking with a counting-down atomic bomb ! OMG, I need information for tomorrow's presentation...OMG, this one need to be done by tomorrow with pictures...OMG, I need to send this to my group member ! Though I avoided one of the bomb, another came. Japanese Language presentation ! I need pictures, a lot of pictures ! OMG, headache + hungry now, I think I should cook my dinner first before I think of any solution. "Sir, before I start my presentation, I would like you to have a chocolate. Take this..."
"Sir... you said that our presentation's topic must be to inform and to persuade right ? So can my topic be 'benefits of chocolate' ..."
"No... chocolates dont have benefits ..."
"... high sugar, cause diabetes...lots of side effects !" "... Ok then, so how about my topic is 'side effects of chocolate' ? Izzit counted as to persuade and inform ?" Although I asked him about the "side effects of chocolate", but in real I searched for the "benefits of chocolate" and started my journey to research on it. Searched for half a day and found myself with tons of chocolate's health benefits to out body. I could use all these to bomb him then, I thought. "Please wear formal during your presentation with blazer..."
"Blazer ?" whole class shouted. "Of course, its a formal presentation. Everyone should had their blazer." "But sir...blazer is not a cheap thing to buy..."
"If you dont have one, I'll bring mine and borrow you. Girls should wear blazer too..."
After some arguing and discussion, "Alright, girls no need to wear blazer. Prepare your presentation visual aids, bring real object or pictures..."
"So we're using PowerPoint to present..." I muttered myself. "Prepare handouts for the audience. And what if the audience want to contact the speaker after the speech ? Yes, business card, attach your business card too..."
First day of the presentation was terrible as Yvonne was stunned by his actions of "answering the call" ... the other half of people who're presenting on the second day doesnt seems to be better. As the last person to present, there's always a pros and cons: use all the remaining time you had or, use all the time you left to present. I offered him a piece of dark chocolate before I start my speech, he was stunned by it. Dont really care about it since I wanted everyone to had a piece in their mouth...so I leave my box of chocolate to my "self-assigned" assistant to pass the chocolate around. "Can I start now ?" "Wait...after you had it, give me the box..." he ordered the group of girls at his side who're taking the chocolate from my assistant. "Can I have another piece ?" he asked me. He had another piece and I starts my presentation. "OMG...is that dark chocolate ? Do you know that dark chocolate is poisonous ? So...let me finish it for you," said one of the girls who sat on the side of the class, joyfully hopping towards me just for a piece when I found my "self-assigned" assistant. "You can have one later on...not now." So after I finish my presentation, I found the container that I used to keep the chocolate on my table. Thinking that they're still some of them left, I opened the cover. Surprisingly, its been swipe clean ! "Sure la, got chocolate to eat wor..." said "My" Chelle. "I only had a piece out of 20+ ... before my presentation !" Never thought it'll be finished by less than 20 people in seconds...luckily, I still had a small bar of it in my fridge at home. Rushed to lecture at 9am today (supposed to be 8am, but ter-sleep) and found out that I missed the quiz for the subject and individual presentation has already begin before I could realize. Found my seat and get myself ready for the presentation. I found out that Mr Cecily didnt pick us up at random, or even ask us to have a lucky draw for the presentation sequence. So I did not volunteer myself out since I'm not as prepared as other people. Some of my fellow classmates presented about Formula One, netball and even WWE smackdown's move. Then its Yvonne's turn to be presenting for her speech and the topic is about colours of wedding gown and its meaning. She seems to be a little nervous, which I'm sure I'll be having it too...and she start off with the famous wedding song. Everyone looked at Mr Cecily, where he picked up his phone and went to the back of the class ignoring Yvonne's half-presented speech. The whole class was stunned and Yvonne actually stopped by the shock of being ignored. She continued her speech and Mr Cecily only went back to his seat when it almost reach the conclusion. And so the very same night of the day, I received Freezie-chan's call in the middle of a sweet nap and I answered "OK" before I realize what I've just agreed to...dinner, which I already had half an hour ago. Anyway, I met her and Hermin, Rannie, Bond, Scotty and Tweety at Rannie's house and we went for dinner. In the middle of the journey, someone shouted that the phone was dropped somewhere and was going back to check where it is. The whole "dinner-thing" had became a "treasure hunt" for the missing phone. Later on I was informed that its Hermin's phone that was dropped somewhere. We searched almost everywhere Hermin could possibly drop her phone: grassy area, road side and where-ever it is. The sky was getting darker and darker, which makes the search more difficult. We tried to call her phone and found that her phone was still functioning, which is a good news afterall. So we called and SMS-ed and searched for the hope of finding the missing phone. Then I saw 'thundaraga", a huge thunder, indicating a rain is coming. I called her phone again and again and suddenly there's a guy on the phone. "The owner called me just now..."
"Oh !? Ok then, thanks." So Freezie-chan had found the phone indirectly and she accompany Hermin to claim back her phone. In addition, Freezie also awarded for "Sending SMS" as she sent 2 SMSes to Hermin's phone to whoever that found the phone. I'm glad that she found her phone back after half an hour of searching in an almost raining and nightfall situation. Its not the phone that matter, its the SIM card that matters the most. Your contact numbers, personal information and sorta things... you cant just lost it like that ! So to those out there... please take a very good care of your cellphone, do not lose it as its as important as your own wallet. Lazy~~ Random update of what happened last week. Really been lazy to post anything up here. Assignments are circulating under my feet wanted to be freed while the procrastinating fishing pole pulls them back beneth the ground, unseen by the naked eye. Oh ya, before I forgot, we TE 4 went to KTAR for a badminton game few days ago. It was fun, never been doing anything so "healthy" since foundation's badminton game, unless you count "cycling to school" in. Still the same word, lazy. Until next time. UTAR-rians Got Flushed Away in Batu Berangkai Waterfall ! This news is what happened for the second post. 5.30pm at Batu Berangkai, 3 UTAR student swept away by the so known "gush of water" in the news. As I remember correctly (and accurately), our gang already went back home by taxi and probably having our shower or in the middle of a nap already. I got a feeling like "that place is not the place that we went right" when "My" Chelle told me about the news earlier through SMS since she didnt mention the name of the place. After I got the link to the news from Freezie-chan and Sensei, I was shocked till I stared on the word "Batu Berangkai" for a minute. Slippery surface of the rocks + fast flowing current = dangerously dangerous. We listened to the taxi driver's advice to leave the waterfall at once when the current is strong. We did it and we saved our asses. For UTAR's sake, please be strong and survive. If you do like to pay your tribute, please visit http://jameskhor.blogspot.com/ . Visit this site for the update of the news. Went to the usual house that I always go: 1238 early in the morning (to be more presice, 6.30am) and saw Jest cooking bihon frustrated-ly. Although I was assigned to make sandwich but since no one is helping Jest, I decided to help her along. After a few minutes, I started to get frustrated as well, coz the wok we're using to cook the bihon is too small and it was hard to cook. After all the cooking and packing it into the container, we called the taxis and start out our journey to Batu Berangkai waterfall at 8am after confirmed we had bring along everything we need. When we all arrived, we walked up the hill with our bags and bottles and all the containers. The scenery was nice and refreshing with lots of durians and rambutans above our heads ! "Can you listen it ?" asked Tweety-chan in the middle of the walk. "Yeah, its been too long since the last time I ever heard the sound of the bugs in the middle of a village or jungle." The sound of the bugs was wonderful, together with the combination of warming hot sun and cooling fresh air, this place is almost gotta be Eden ! After 10-15 minutes of walk with sweat for me, we reached the waterfall that we're looking for ! We found ourself a tent or whatever-it-is-called and placed our belongings there. This place is called Batu Berangkai, people usually came here for picnic and relaxation, but we're here just for the coldness of the water. The surroundings are so beautiful and what are you waiting for ? Jump in now ! The water is really clean, I'll give it 4 out of 5 if there's a rating. We played volly ball together and splash water on those who cant pass the ball nicely to the opposite site. Hey stop splashing, the water is so cold ! Around 2-3pm+, we packed our stuffs up and ready for going back home because we saw the current is getting stronger and stronger with time. Its for our safety and we do not want to risk anything. Then those "another gang of UTARians" I mentioned earlier also packed their stuffs and we said "bye" to each other. They claimed they're CS student, hopefully we'll meet again around UTAR ! Its really fun to hang out together with a group of friends. All 15 of us were so happy to be there for a relaxing trip. Thanks to Jest's idea, we TE 4 finally went to a place and hanging out together. There's a total of 271 pictures taken in this trip including 3 videos. I'll try to upload what I took in a second post.